FRANKLIN LAKES – Holding a two-goal lead against Waldwick on Saturday night in the semifinals of the Bergen County Boys Soccer Tournament, Ramsey was in a dominating position. The Rams, the highest seed left in the tournament and still unbeaten, have taken games by the throat all season long and were heading for halftime with what seemed to be a comfortable advantage and chance to solidify their tactics to close out the victory. Waldwick, the Group 1 charger that had already dispatched four-time defending champion Ramapo and Group 4 Ridgewood in the previous two rounds, had other ideas. The Warriors were not just a nice little small school story; they were determined to write another positive chapter and very nearly did. Waldwick pulled a goal back just inside the final three minutes before halftime then turned the second half into a wildly entertaining back-and-fourth affair that had its outcome decided 68 second span at opposite ends of the field. When it was all said and done, Ramsey held off the challenge and earned a spot in the county final for the first time since 1991 with a 3-2 victory at Ramapo High School in Franklin Lakes. Christopher Borgese scored a goal, assisted on the other and was a hanful all night leading the Waldwick attack. This has been the most unpredictable Bergen County tournament in years. Ramsey was the only one of the top four seeds to make it to the semifinals, while Waldwick has shown no fear in tussling with the big boys. Although the advantage in possession was not lop-sided in either direction, it might have favored the Warriors early in the game until Ramsey found the first breakthrough. A slight misplay in the back opened the door for Brian Miller, who ran onto the ball and boomed it home to make it 1-0 Ramsey in the 11th minute and the Rams went up 2-0 on Sean Connolly’s tally in the 22nd minute. 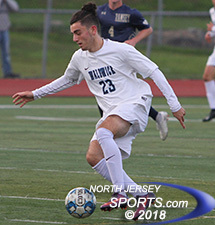 Even though it was behind for most of the first half, Waldwick was always dangerous especially when sniper Christopher Borgese had the ball at his feet or was using those feet to run on. He altered his angles of attack often and stayed after it until his opportunity arose. With three minutes left in the first half Borgese was 50/50 on a through ball with a Ramsey defender before edging in front, keeping his balance and hitting the lower right hand corner that dragged Waldwick back to within 2-1 at the intermission. Borgese was not done, either. Three different times in the midway region of the second half he nearly brought his team back square. He did everything but score after mixing it up with two defenders in the 47th minutes, he forced Ramsey keeper Justin Siegel into an on-the-floor save with an attempt off the outside of his right foot one minute later and then was robbed of the equalizer by the hustle of Ramsey defender Zach Peters in the 64th minute. Zach Peters cleared two balls off the line for Ramsey, which will play Glen Rock in the championship match. Borgese tried to dribble around and through a host of Ramsey defenders on the edge of the area and then reappeared on the back side of the pile with the ball at his feet and an empty net to shoot at. With Siegel involved in the original scrum, it fell to Peters to and he got his body in front of the shot to keep the Rams in front, at least temporarily. Waldwick, however, just kept coming and again it was Borgese in the middle of it. He squirted free up the left, centered a pass that was knocked off line slightly by a defender’s boot and then ricocheted into the path of Michael Negron, who made not mistake in tying the game at 2 with 15:23 left in regulation. Waldwick seized the momentum for all of 38 seconds, the amount of time it took for Ramsey to move from the center-stripe restart to the right corner to the front of the goal. Using the right side of the field, the Rams got deep and sent in an elevated cross for Charlie Illes, who headed his volley smack off the crossbar. The rebound came out to Miller, who had time to think about what came next. 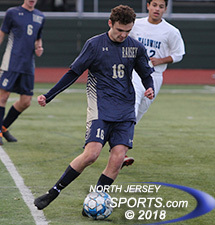 Peters knocked another ball off the line with just over 11 minutes to go to foil Waldwick’s last best chance as Ramsey claimed a spot in the county final for the first time since 1991 when it lost the championship match to Ridgewood on penalty kicks.